List researched and compiled by Aaron Maizlish 2003. March 10, 2006: At the completion of the ultras project, I am changing the prominence value on this list from "clean prominence" to "interpolated prominence" in order to reconcile the methodologies on the ultras list. The elevations of the summits and saddles on this list were all taken from national 1:50,000 mapping series, most of which were produced in cooperation with the U.S. Army Map Service (now NIMA). The prominence value is equal to the elevation minus the saddle minus one-half of the saddle contour interval. These values have been cross-checked against SRTM and have been found to strongly agree to within 1/2 of a contour interval. Volcan Irazu Costa Rica 3,402 1,872 1,540 20 N 09º58'36"
Volcan Miravalles Costa Rica 2,028 1,533 500 10 N 10º44'48"
Volcan de San Miguel El Salvador 2,130 1,840 300 20 N 13º26'06"
Volcan de Santa Ana (Ilamatepec) El Salvador 2,362 1,622 760 40 N 13º51'21"
Volcan de San Vicente El Salvador 2,182 1,572 620 20 N 13º35'48"
Volcan de Agua Guatemala 3,761 1,991 1,780 20 N 14º27'57"
Sierra de los Cuchaniantes HP Guatemala 3,837 1,887 1,960 20 N 15º31'09"
Montaña Peña Blanca Guatemala 3,518 1,868 1,660 20 N 15º30'00"
Volcan Acatenango Guatemala 3,976 1,846 2,140 20 N 14º30'03"
Volcan Atitlan Guatemala 3,537 1,754 1,783 - N 14º35'00"
Montaña de Santa Barbara Honduras 2,744 2,094 660 20 N 14º54'48"
Montaña de Celaque Honduras 2,849 2,079 780 20 N 14º32'03"
S. of Pico Bonito Honduras 2,450 1,720 740 20 N 15º33'33"
Montaña San Ildefonso (Cerro Jilinco) Honduras 2,242 1,712 540 20 N 15º31'24"
Cerro el Pital (Pt. 8957) Honduras 2,730 1,540 1,200 20 N 14º23'09"
Montaña los Comayagua Honduras 2,407 1,517 900 20 N 14º29'42"
HP Sierra de Agalta Honduras 2,335 1,505 840 20 N 14º57'27"
Volcan San Cristobal Nicaragua 1,745 1,675 80 20 N 12º42'09"
Volcan Concepcion (Isla de Ometepe) Nicaragua 1,611 1,576 35 - N 11º32'18"
Loma Gajo en Medio Dominican Rep. 2,279 1,789 500 10 N 18º38'12"
Loma Alto de la Bandera Dominican Rep. 2,842 1,512 1,340 20 N 18º48'51"
Chaine de la Selle Haiti 2,680 2,655 30 10 N 18º21'36"
Pic Macaya Haiti 2,347 2,097 260 20 N 18º22'57"
Elevation values were taken primarily from the various 1:50,000 National Surveys (mostly 1960s-1980s AMS maps, the predecessor to NIMA). If you know of more current surveys and elevations please contact the author. Also note, this table uses the "clean prominence" rule to determine P-value. In other words, the prominence stated is the minimum possible value within the error range of the stated contour interval. This is the same convention that we currently use on all United States and Mexico lists; where the values are from topographic maps. Tables for the rest of the world employ an "interpolated prominence" rule, i.e. the stated prominence value is either estimated from the SRTM data, or adds one-half contour interval from the topographic map to the clean prominence value. Cerro Chirripo: The elevation has been corrected to 3,820m, the topographic map gives 3,818m. The key saddle of Chirripo should be at the Panama Canal, as this would have been the natural saddle prior to the massive earth-cut. We have estimated an original saddle elevation of 93 meters ASL. Santa Ana: Saddle elevation of 760-40m needs to be rechecked against SRTM value of 712m. Pico Bonito: Published height of the summit is 2,435m. SRTM suggests that there is a higher point to the south, but this is as yet unconfirmed. Sierra de Agalta: Map gives spot elevation of 2,590m, which is almost certainly a misprint, based on SRTM data HP of 2,335m. Concepcion: Isla de Ometepe is an island in the Lago de Nicaragua. This is the only known lake-island ultra-prominence in the world. Panama: SRTM analysis reveals two ultras in the east of Panama (Darién), near the Colombia border. 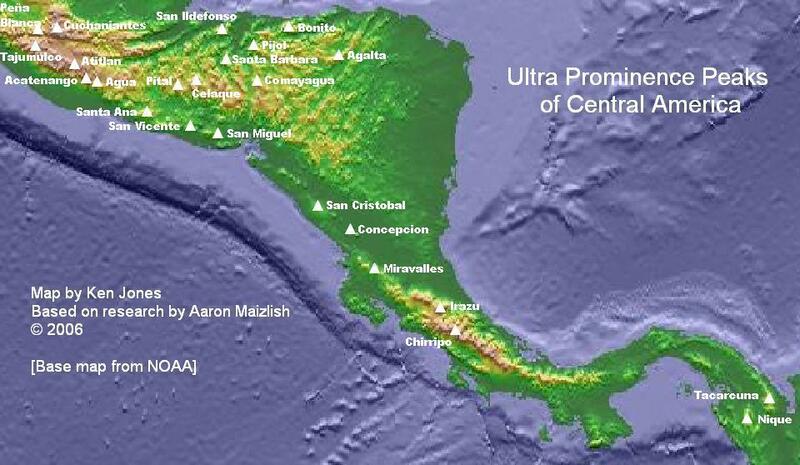 This border region is notoriously poorly mapped, so the saddle and prominence values provided are from SRTM. In the west of the country, the prominent Cerro Santiago remains a mystery: 1:50,000 topographic maps give an elevation of 2,826m. This elevation is repeated in many publications, including soviet mapping and the Times Atlas of the World. The SRTM data gives a completely different picture of the topography of the region, suggesting that the peak may be no higher than 2,550m. The key saddle is 1,110m, meaning that the prominence is 1,716m if you believe the former, or 1,440m if you believe the latter. The mountain has been removed from this list pending further investigation. Pico Turquino: The highest SRTM cell, at 1974m, suggests that the official elevation for Pico Turquino may be overstated. Pico Duarte: The highest point in the Dominican Republic and the Caribbean. Reference cited is a definitive 2003 GPS survey by Ken Orvis published in the Caribbean Journal of Science. This survey gave an elevation of 3098m. SRTM provided a highest 3" cell of 3093m. In 2005 prominence-oriented climbers Bob Packard, Edward Earl and Adam Helman obtained GPS readings consistent with the 3,098 meter value.